That’s why we created the Inasmuch Life process to help churches mobilize their people to volunteer on a regular basis, with lifestyles of compassion ministry. But sometimes a church needs no training! CHESANING – For the past year, Chesaning area volunteers have been dedicating one Saturday a month to provide food for those in need. It’s an extension of Operation Inasmuch; which focuses on helping others. During the past year, several area churches, local businesses, some national chain stores and the Chesaning Union School District have all contributed to make the food program work. Once a month, each family receives a box full of food to help them through tough times. Cash donations are needed to keep these truckloads of food coming. The project coordinator, who prefers to remain anonymous, said, “We got through the first year. We can see this is going to be a big need in the community, and we’re growing.” Presently, 175 boxes are given out on a monthly basis, feeding about 475 people per month. The coordinator explained that while the food is not free, over the past year, the cost of truckloads of food has been $500 each month. But with increased fuel costs, the food will now be 0 each month. Local churches, businesses, even several individuals, have donated money to keep the food deliveries coming. Those in need who would like to be put on the list of food recipients should go sign up at the Chesaning Area Emergency Relief (CAER) center up to two weeks before the food is delivered. The truck arrives on the second Saturday each month, loaded with 10,000 lbs. of food coming from the Food Bank of Eastern Michigan. Swartzmiller Lumber owner Don Swartzmiller has been bringing equipment to unload the truck each month. Approximately 50 volunteers help through much of the day sorting food into boxes. Over the past year, most of the food distributions have taken place at Trinity United Methodist Church. Although during the winter months, they were able to use the Chesaning Union Schools bus garage; which enabled volunteers to work indoors. 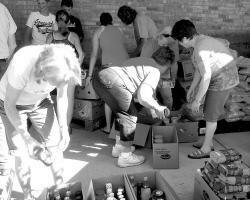 During the past year, the following organizations, and individuals, have donated funds to cover the cost of the monthly food deliveries: Our Lady Catholic Church, St. Mary Church of Albee, St. Michael Church of Oakley, Trinity United Methodist Church of Chesaning, Family Dollar, Walmart, and even an individual who had benefited from the food program while he was unemployed. Other organizations that have contributed include: Frank’s Super Market (provided older shopping carts and boxes for packing food), Nixon’s Grocery (helps with food for community suppers), and the Boy Scouts (carry boxes to vehicles for people and help with the community suppers). With so many families needing help at this time, more cash donations and volunteer labor are needed to continue this worthwhile Operation Inasmuch food program. “Some of the recipients think the food is free. It’s not free. It’s kind of a hardship for us to do this. But the need is here,” the coordinator said. Donations can be directed to the Trinity United Methodist Church. Those interested in volunteering can call the church as well; (989) 845-3157. Enid, Oklahoma has been recognized as the Caring Capital of the Cowboy State. As such, Enid joins Sumter, SC, Fayetteville, NC, South Western Region, CT, Danville, VA, Fort Collins, CO, Knoxville, TN, and Santa Clarita, CA for having been dubbed centers of compassion for their state by the Urban League. All these cities have something else in common: a local Operation Inasmuch Affiliate helped them grow into centers of compassion. “It all began in 2012,” says Luke Thomas of Enid’s Samaritan House. But it didn’t stop there. The churches were empowered by these collaborative efforts and soon formed an Operation Inasmuch affiliate that now organizes each Inasmuch United event in Enid. The affiliate also trains new churches every year to join in and serve. A couple years later Enid Operation Inasmuch began to equip some of the veteran Inasmuch churches to release their people to volunteer in the community on an ongoing basis through their Inasmuch Life process. The organization then helps the churches by acting like a matchmaker between church and compassion ministry, bringing willing believers together with people in need year round to serve them and help them solve their problems. “To say that Enid is a different place today because of Operation Inasmuch’s ministry would be putting it mildly,” says Thomas with a broad smile on his face. Undoubtedly, some of Thomas’ smile is due to the success of the Samaritan House where he is the Executive Director. Sam’s Place — as it is affectionately called after its namesake, the good Samaritan — provides a place to live for 30 men who each have two chronic illnesses and were homeless. As Thomas tells it, in the fall of 2012 a group of volunteers came from Eastminster Presbyterian Church during the Inasmuch United Enid to prepare and serve dinner to the 30 residents of Samaritan House. The volunteers were so impressed with the men who live there and the care Sam’s Place provides that they came back the following month. It is now going on seven plus years that the same volunteers have been serving dinner at Sam’s Place. 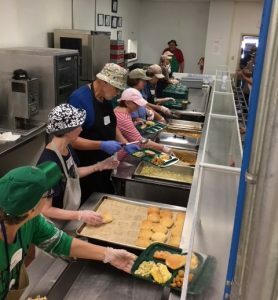 Thanks in part to the organizing efforts of Enid Operation Inasmuch, there are now 20 congregations who send volunteers each month to serve dinner. “And there is a waiting list of churches wanting to help,” says Thomas shaking his head. Here’s a question for Christmas: Is compassion seasonal? How many people do you know who are conscientious in serving people in need at Christmas but do not give it much thought at other times? Is compassion ministry another item on our Christmas To-Do list like shopping, attending parties, and the Christmas Eve service at church? Benevolent ministry leaders are quick to lament the fact that so many people seem motivated to serve others only at Christmas. We talk about the need, even the desire, to have the Christmas spirit year round — which presumably would include serving people in need — but does it happen? When Jesus said, “Inasmuch as you have done it [given clothes to the naked, visited the sick or imprisoned, given food for the hungry], you have done it for me,” he wasn’t thinking about Christmas. When he told those in his hometown of Nazareth what he would be doing in his public ministry (Luke 4: 18-19) and, by implication, announced what his followers would do, he was not talking about Christmas. How DO we perpetuate that onlinepharmacies247.com/imitrex.html part of the Christmas spirit that motivates us to serve people in need year round? It begins with an understanding that compassion ministry is an indispensable part of being a follower of Jesus. All of Scripture makes that clear, especially the Gospels. In the remaining days of this Christmas, when most of the hectic stuff is over, why not spend a little time reflecting on how to extend the Christmas spirit well into 2012? As you think about what you’d like to accomplish in the New Year, why not re-read the Gospel of Luke, the most compassionate of the Gospels, and listen to God’s voice to you? 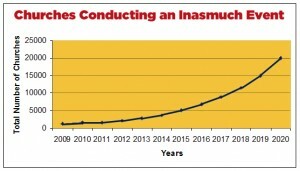 The Inasmuch ministry is about motivating, equipping and deploying believers throughout the Kingdom into lifestyle compassion ministry—serving people in need using one’s life experiences, passions and skills as a matter lifestyle. To put it another way, Inasmuch Life perpetuates that part of the Christmas spirit which leads us all to be more compassionate and generous than normal. Inasmuch Life means keeping the spirit of Christmas all the time. Merry Christmas from the Inasmuch Team. Inasmuch Life is Coming to Life! Operation Inasmuch is moving in new directions. If you’ve visited the new web site or read recent eNewsletters, you know that we are piloting our new Inasmuch Life process by which churches can help more of their people enter lifestyles of compassion ministry, serving the neediest in their communities on an ongoing basis. For many years, Operation Inasmuch has equipped churches to send their congregations out to volunteer on a single day of community service projects. In many cases, an Inasmuch Day project led to an ongoing ministry (for examples, see the Parkridge Harbor and Roosevelt’s Story videos on the website). Moreover, Dr. Crocker’s book The Samaritan Way has inspired many to enter into lifestyles of compassion ministry. But sometimes it helps to have a plan. And that’s what we are piloting: a process by which churches can mobilize many in their congregations to serve the needy in their communities more deeply and effectively. So far, so good! Our first Inasmuch Life pilot is well underway. Over 150 volunteers from our pilot church of 1000 stepped up to move out and serve. Most of these people had never served in a compassion ministry! Already many are engaged in a local ministry or agency, while others are still finding the right fit, and still others are going through an application process. We are thrilled that volunteers are starting at least three new mercy ministries in the church, as well. The Senior Pastor of the first pilot church said, “This initiative has truly been an answer to my prayers for our church.” We can only thank God for answering our prayers, too, and making the first Inasmuch Life pilot a success – and a great learning vehicle! We have already modified much of the process from this first experience and will use this feedback in our next two pilots, both of which are underway. If you are a donor to Operation Inasmuch, Inc., we want to especially thank you. We are spending a great deal of time and resources developing Inasmuch Life and have charged no fee to the pilot churches involved: your investment has made this new venture possible and is having an impact on many lives! Google or search YouTube for “Inasmuch” and you’ll see an amazing number of hits and videos. But the results are confusing. When people use the name Operation Inasmuch, they may refer to an organization (that’s us!) or a day (that’s what we equip churches to do!). On top of that, the day and the organization have also been called In As Much, InAsMuch, OIAM, Inasmuch day, Inasmuch event, Inasmuch blitz, Serving [City] As One. And searches on those names will yield several different logos, too! Those not familiar with Operation Inasmuch wonder if all these organizations found in an Internet search are related. And if so, how? And it is sometimes difficult to explain to potential churches and donors who we are and what we do! Operation Inasmuch The national organization as well as the compassion movement of which we are all a part – an operation of the Spirit to send more and more people from the church out to serve in their communities (which leads to our new tag line: A Compassion Revolution).